I've posted before on the model children found on the facades of charity schools (looking at examples in Rotherhithe and Hatton Garden). 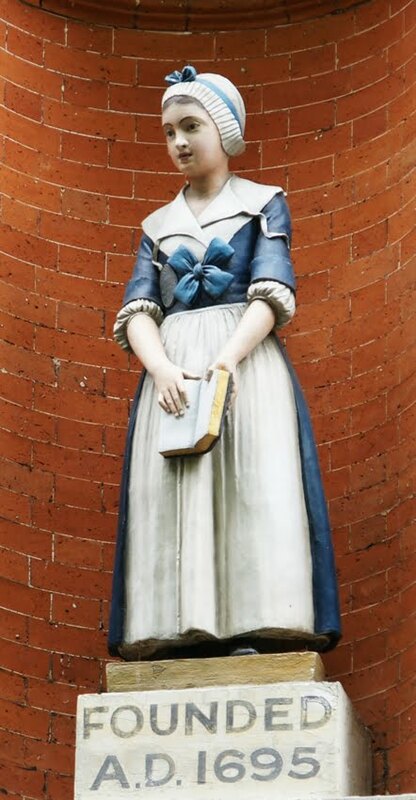 They served to show that the building was a school and to advertise the uniform, usually provided to the child and better than any clothes she currently possessed. On a Victorian Society walk through Docklands this weekend, I saw several more examples. Raine's School was established in Wapping in 1719; its premises have moved a number of times since, and these figures accompanied several of those moves before returning to the original school premises. 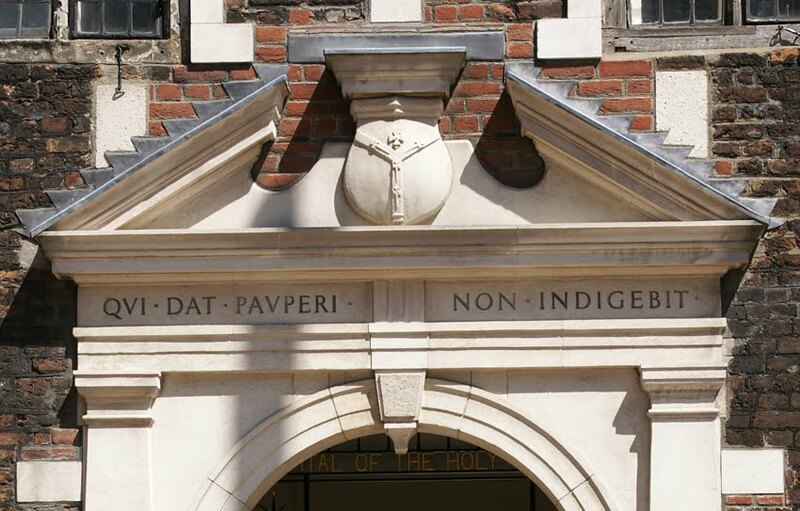 Between them is the rather austere motto, 'Come in and learn your duty to God and man'. 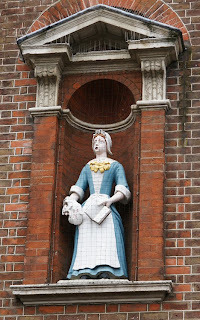 The school was founded by brewer Henry Raine, for fifty boys and fifty girls. Boys learned reading, writing and arithmetic before being apprenticed at age thirteen. Girls were taught reading, knitting and sewing; they generally left at the age of ten, but each year ten of them would be selected to continue to boarding school. The boarding school sounds utterly miserable: the girls were to earn the salaries of their mistress and cook by sewing and knitting; the outer gate was kept locked and the girls not permitted to leave even on errands; no contact was allowed with families except on four one-day holidays a year. After four years of this regime, girls became apprentices or servants. It is unsurprising that a number did not complete the four-year training, either being expelled or absconding instead. 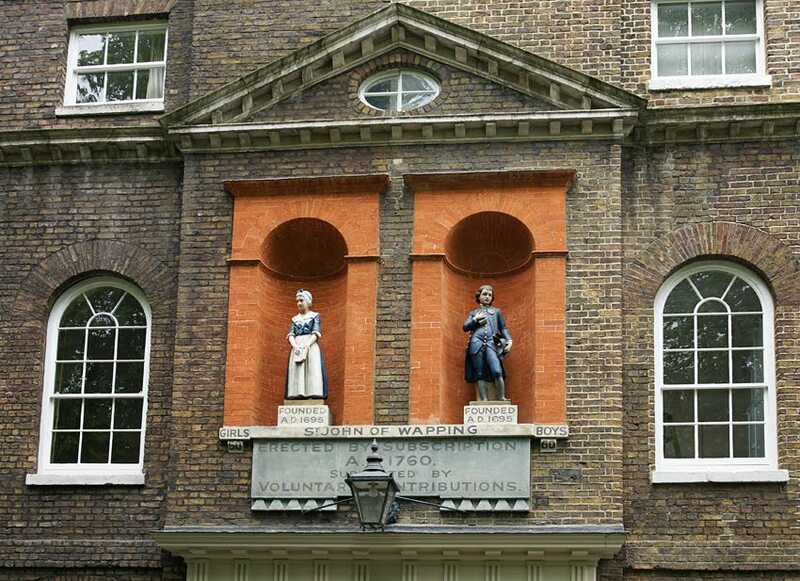 Also in Wapping is St John's School, founded in 1695 and moved to this building in 1756. 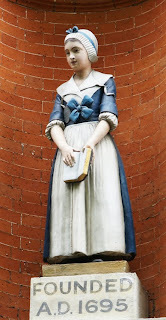 The statues are accompanied by additional information including the school name, foundation date, the fact it was supported by voluntary subscriptions, and even the pupil numbers: 50 girls and 60 boys. 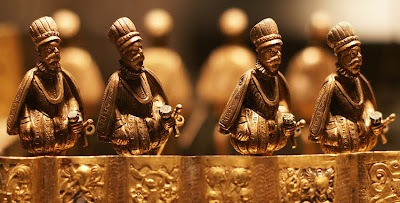 Most notable is the quality of the figures, which have fine detail and a natural appearance rather than the generic and imprecise features of most examples. Quality aside, there are similarities between all these schoolchild figures. Some features ensured that their purpose was recognisable: hence the fondness for placing papers or books in their hands. The general style of uniform reflected clothing styles of the period. Less obvious is the fondness for blue uniforms, but there's a very practical explanation: it was the cheapest dye. 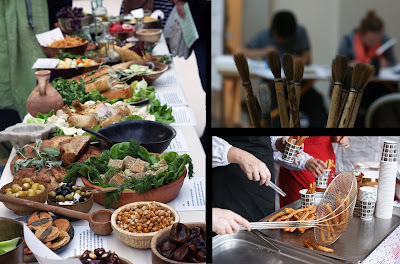 To accompany the History of the World in 100 Objects, the British Museum held a feast-themed evening. From churros to cupcakes, classical dishes to art workshops, there were plenty of activities to feed and fascinate. My favourite object of the night, which will feature on the History series in September, was not edible! 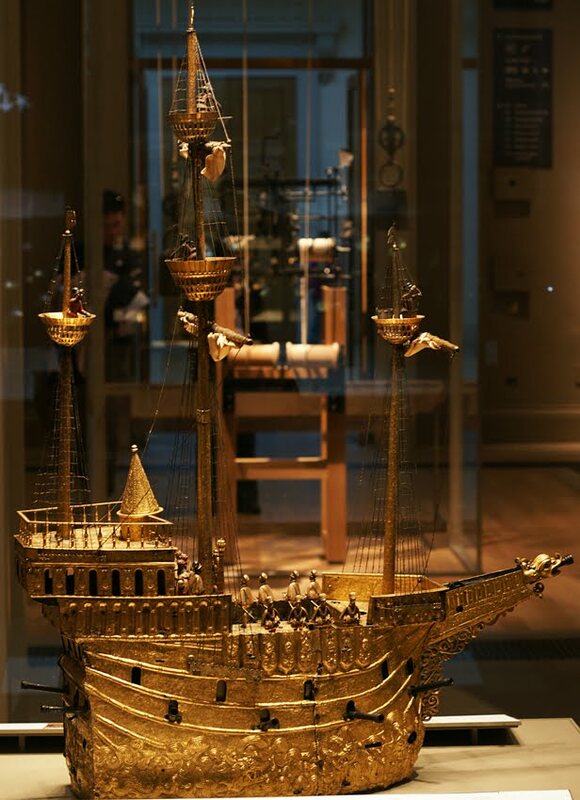 On the contrary, it's an elaborated gilded model of a galleon, made in Germany in about 1585. The details are incredible: crew members in the crow's nests, guards along the edges, a monster-filled sea lapping around the base. The Holy Roman Emperor sits under a canopy, with the Electors in front of him and before them the double-headed eagle and pillars which were his royal symbols. 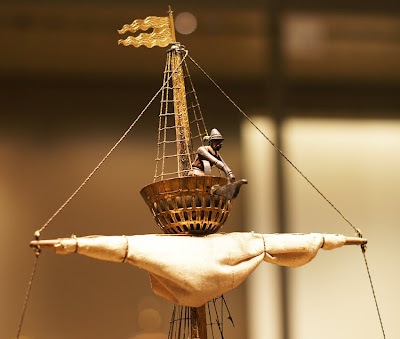 There's even a clock (the sailors in their crow's nests used their hammers to strike the hours). About the only thing not depicted is, well, food. So how is this relevant to the feasting theme? The answer is in the object's use: it was designed to announce the beginning of a banquet. 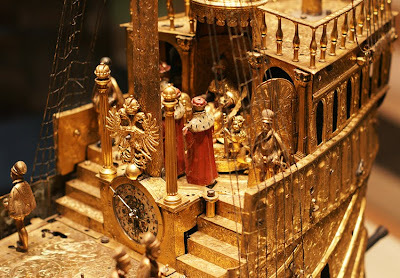 An organ inside the hull would play music, the Electors and heralds processed, the galleon moved forward, the cannon at the front would fire, and then the smaller side guns each fired in turn. (One assumes that they weren't actually loaded!) Once the guests had got over their amazement, the dining could begin. 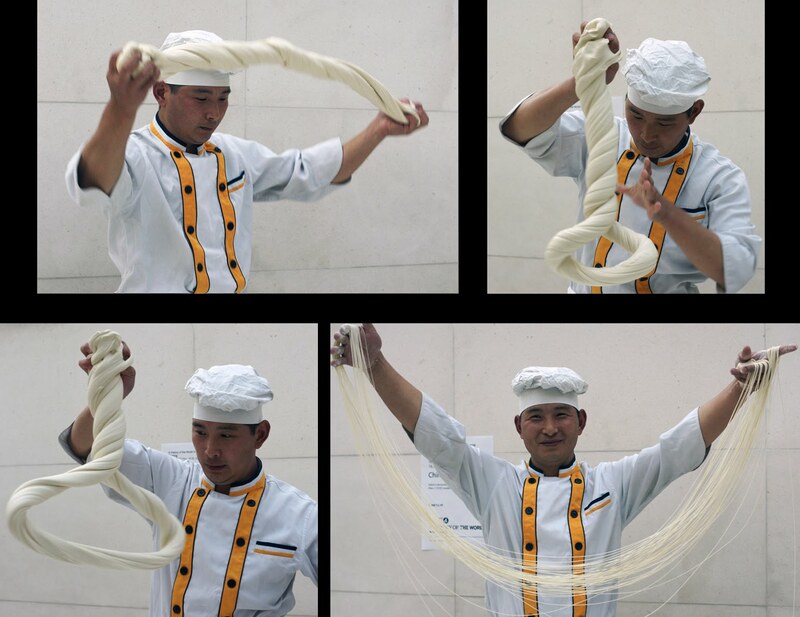 A much more prosaic object - a lump of dough - formed the basis of another dramatic activity. During the Chinese noodle-making demonstration the dough was flung, twisted and looped through the air until it had, almost magically, become a mass of fine noodles. 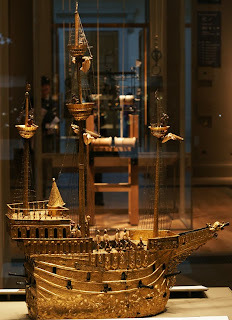 There may have been no gilt, music or cannonfire but this was just as impressive in its way. 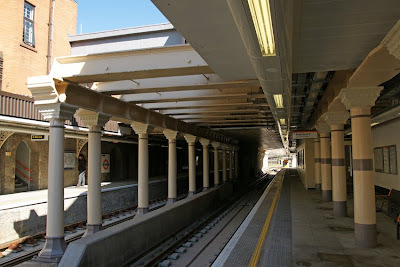 The East London Line, just before it splits between New Cross and New Cross Gate, stops at Surrey Quays. 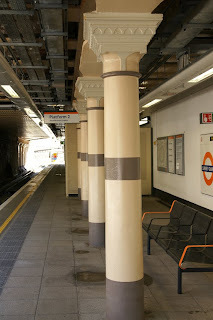 One glance at the station interior makes it obvious that this predates London Overground by quite some time. Indeed, it opened in 1869 as part of the East London Railway, predecessor of the ELL. You won't find the name 'Surrey Quays' on Victorian maps or timetables: the station was originally Deptford Road. The Surrey Commercial Docks were a few steps away, so the name was changed to Surrey Docks in 1911. Docks were first established in this part of Rotherhithe to take 'overspill' from Deptford Dockyard, but they grew into an enormous complex receiving ships from all over the world (as names like Canada and Greenland testify). The dockers working here included specialist deal porters. These men carried huge loads of rough timber (deal or pine) imported from the Baltics, and wore special leather hats with a flap extending over their shoulders to protect themselves. However, the weight and splinters were not the only challenge they faced: since the wood was stacked up to 60 feet high, they had to carry the baulks of timber as they balanced on planks high above the ground. Hard and dangerous as the work might be, it also offered permanent employment (in contrast to the casual labouring endured by many dockers) and jobs were passed down through families. In the Second World War, the docks suffered heavy bombing. The South Dock was also dried out and used for constructing concrete caissons which formed part of the D-Day Mulberry Harbours. After the war, there was some recovery but containerisation was the final blow: the docks closed in 1969. The final indignity was the change of station name to 'Surrey Quays', prompted by the opening of Surrey Quays Shopping Centre in 1989. 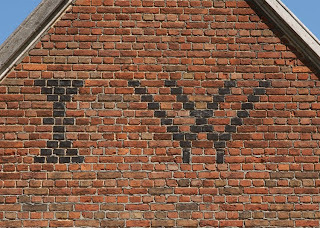 The surviving Victorian details now look slightly random, especially the suddenly-truncated row of columns in the centre. However, they add both character and a reminder that this area has a history which long predates the shopping centre and News International premises now outside. Just outside Hoxton station, the view from the train windows includes a ghost sign. Stamford Trading Co of Geffrye Street proudly displays its telephone number, now antiquated. 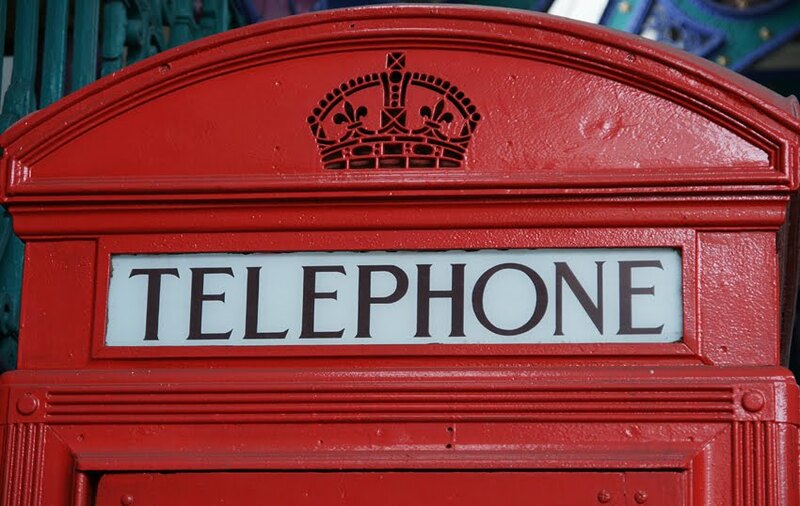 Originally, London exchanges were known by three-letter codes which corresponded to numbers on the telephone dial. SHO for Shoreditch translates to 740 (the letter placement was not the same as that on modern mobile keypads: O and Q were placed at zero). *Admittedly it didn't have privacy, convenience or affordability. In one of the more unusual uses for the shiny new Margaret McMillan Park, a marching band has just wandered through - to the surprise of at least one cyclist! Any idea who they are? The likeliest local candidate seems to be Utrophia's band. 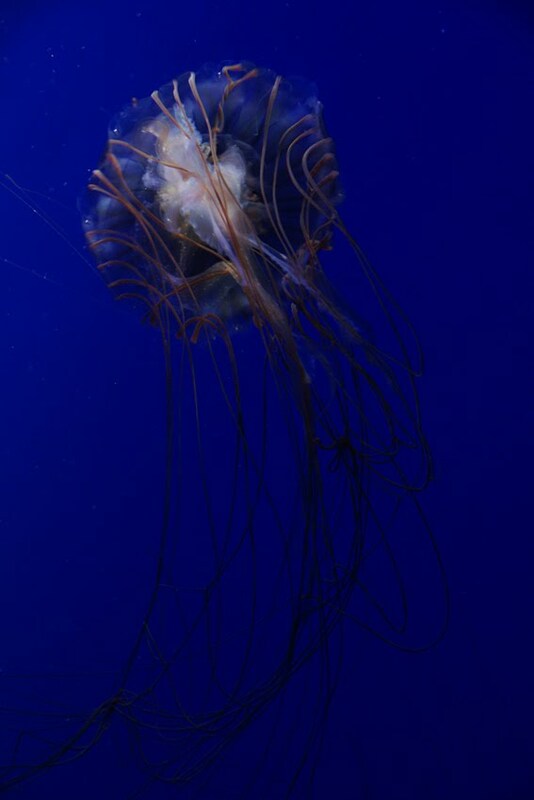 These wonderful creatures can be seen - for free - at the Horniman Museum's aquarium. 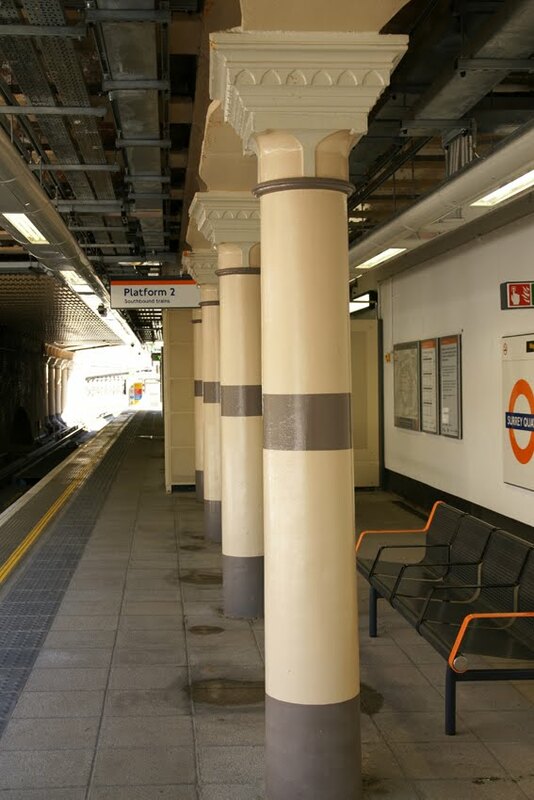 It's in the basement of the museum, just a few minutes' walk from Forest Hill station on the East London Line. 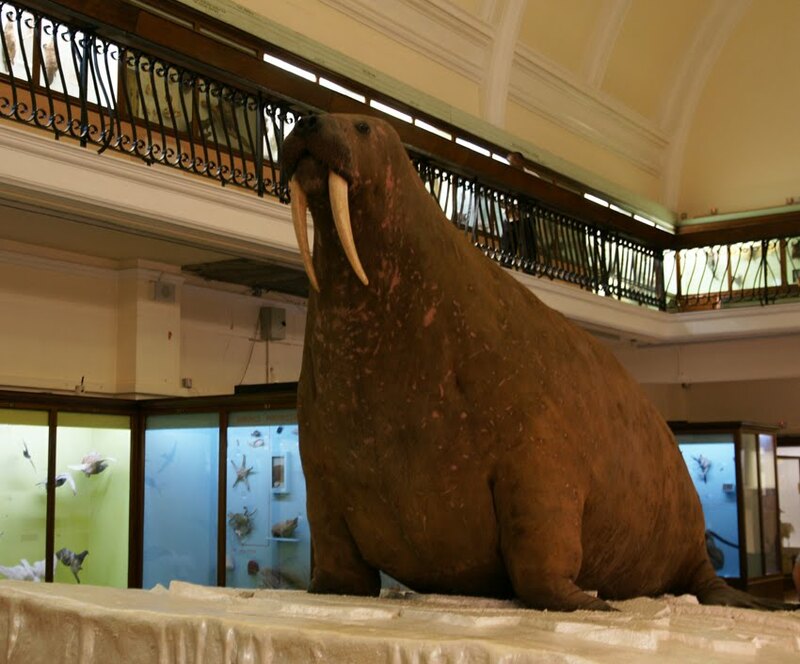 If you fancy something a little less fishy, then don't miss the Horniman's famous walrus. He was brought from Hudson Bay, Canada in about 1870; he's a little overstuffed because the Victorian taxidermist didn't know where skin folds should be, and a little patchy because he's been on display for a very long time. However, like all the best stuffed animals, he's perhaps loved all the more for his imperfections. Head to the southernmost station on the East London Line, West Croydon, and you can see the modern office blocks and large shopping centre for which the town is best known. 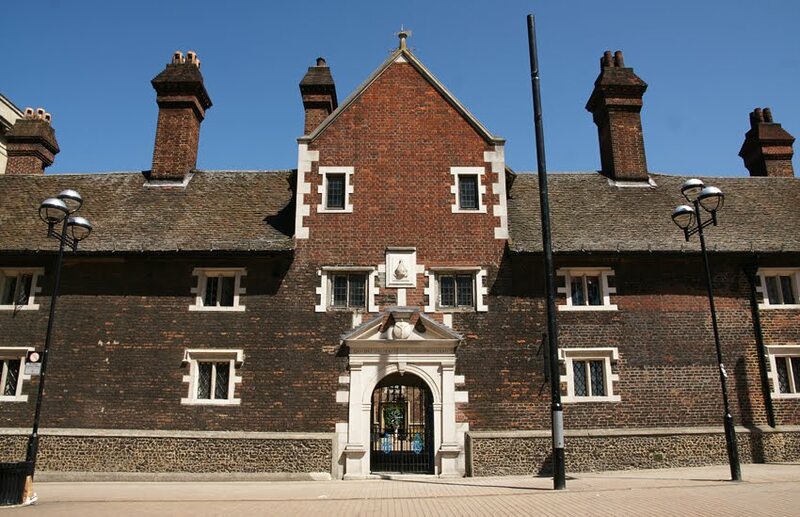 You can also see a real jewel, the Whitgift Almshouses which sit among the chainstores like architectural time travellers. to be an hospitall and abding-place for the finding, sustenation and relief of certain maymed, poore, needie or impotent people to have continuence for ever. 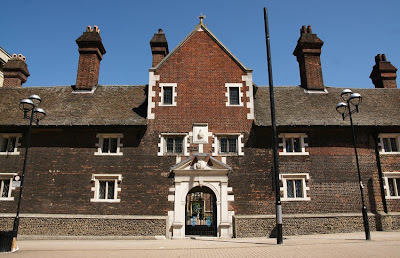 The survival of this institution, today known as the Whitgift Almshouses, is something of an achievement. The most recent major threat was a road-building scheme in the 1920s; the almshouses were saved by the House of Lords' intervention. There are still residents living here, observing the customs of the place. 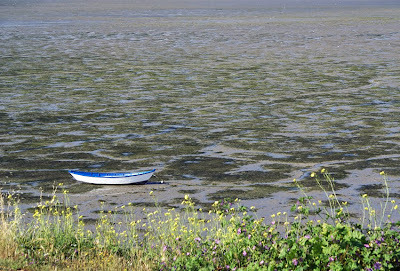 Thus the person who has lived there longest rings a bell at 10am each Friday morning, and the stipend ceremony begins. Each resident receives a small sum of money (70p for women, 65p for men). Today, of course, that isn't even enough for an ELL ticket. Today was the official opening - the northern part has of course been open for a while unofficially - and I took the first train from New Cross before heading down the brand new section to West Croydon. 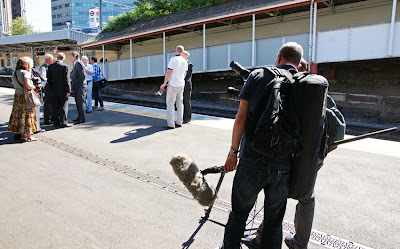 At ten in the morning, there were more media and TFL people than genuine passengers on the platform. (c) they were oases of air-conditioning on an insanely hot day. 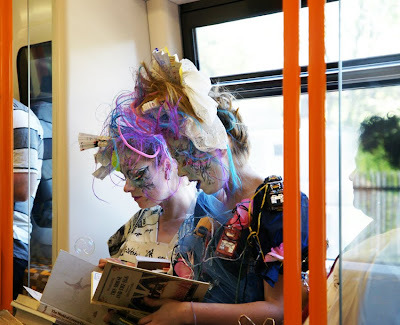 Whatever the reason, everyone seemed to be enjoying the new service despite the complexities of three southbound destinations (New Cross, Crystal Palace or West Croydon) and the panic engendered by pre-recorded announcements for 'Arkly Station' (later corrected to 'Brockley'). Odder moments included an on-board 'performance' which made little sense - even less after reading the accompanying handout - but did look very decorative. Now home (and missing the air conditioning already), I have not only memories and photos but also a souvenir ticket and travelcard holder. 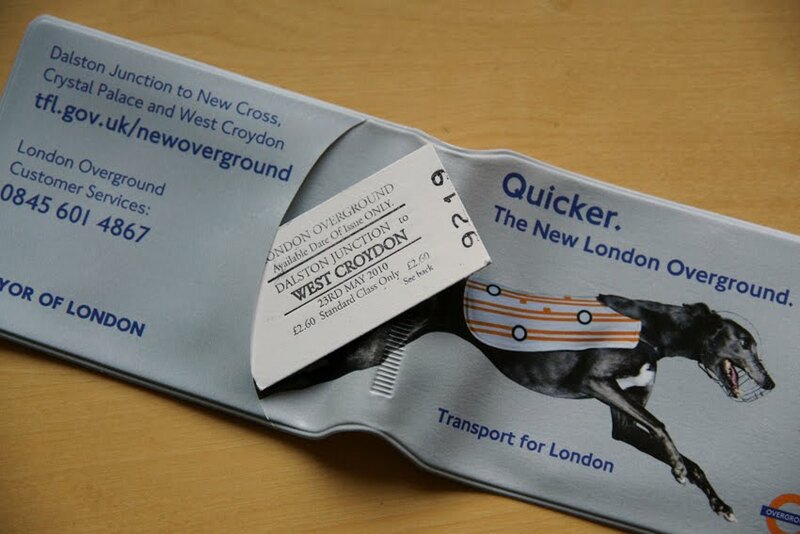 We obviously won't get that sort of service every day, but the ELL certainly won the hearts of many Londoners today. More on the opening at IanVisits, London Reconnections, Brockley Central and East London Lines. In the heart of the financial district and just a few steps from Lloyd's, it's unsurprising that this office building is full of insurance and finance firms. 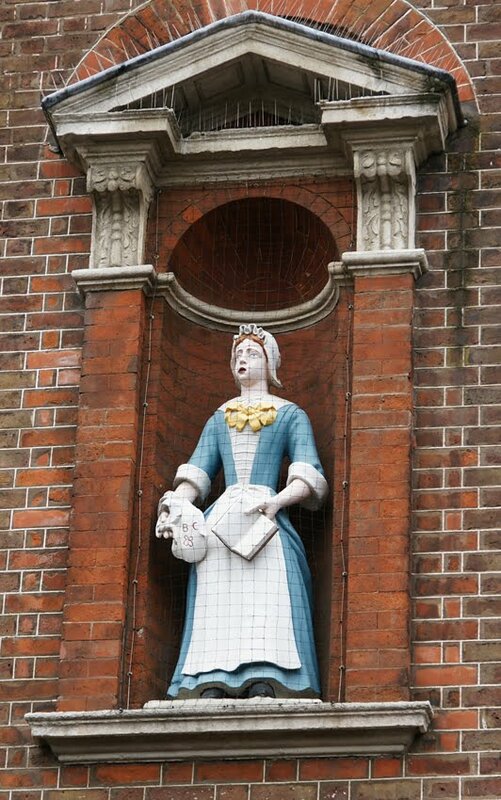 However, at the entrance are two figures which illustrate not those concerns but rather the building's name, Asia House. Its architect, George Val Myer, is better known for his later Art Deco-influenced buildings such as the BBC's Broadcasting House in Portland Place and the Halifax building on the Strand. This earlier commission was built in 1912-13, when Val Myer was just turning thirty. 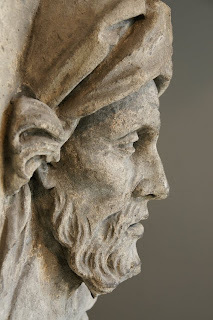 These reliefs were the work of John Broad, a Doulton employee who specialised in sculpting figures. His larger works include Queen Victoria and the India group on the Doulton Fountain in Glasgow. This bus was driving through Greenwich on Sunday - only a few miles out and a few decades late! I was in the town centre to visit the recently-opened Discover Greenwich, a new visitor centre/museum in the Old Royal Naval College. 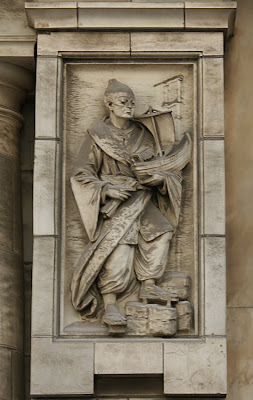 A particularly nice theme is the focus upon craftspeople involved in the building of Greenwich. 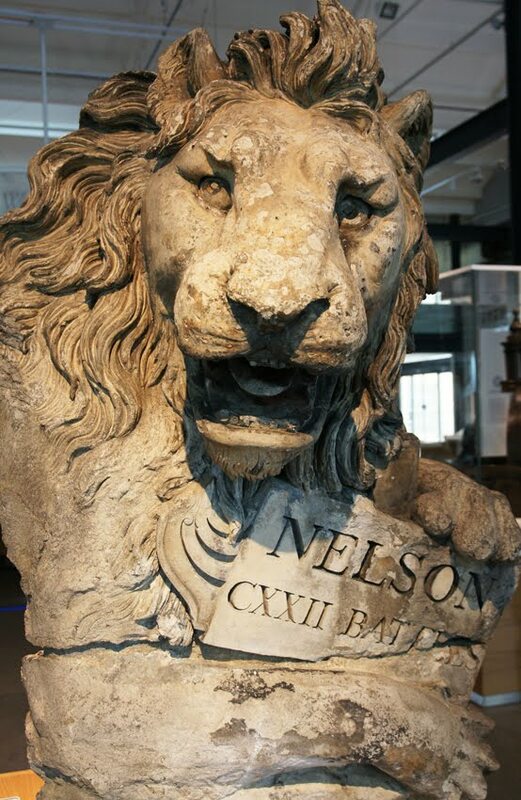 It's illustrated by some impressive pieces of stone-carving and artificial Coade stone as well as by tools, materials and so on. I learned something new about the Coade factory, too: they employed children to push the paste into moulds, as their smaller fingers could reach into the areas of finer detail. There were plenty of other aspects of Greenwich history to explore too, from the royal palace to the 'cabins' of Naval Hospital residents. Some exhibits seemed to prize multimedia and interactivity over actual clarity, but on the whole the centre is worth a visit. 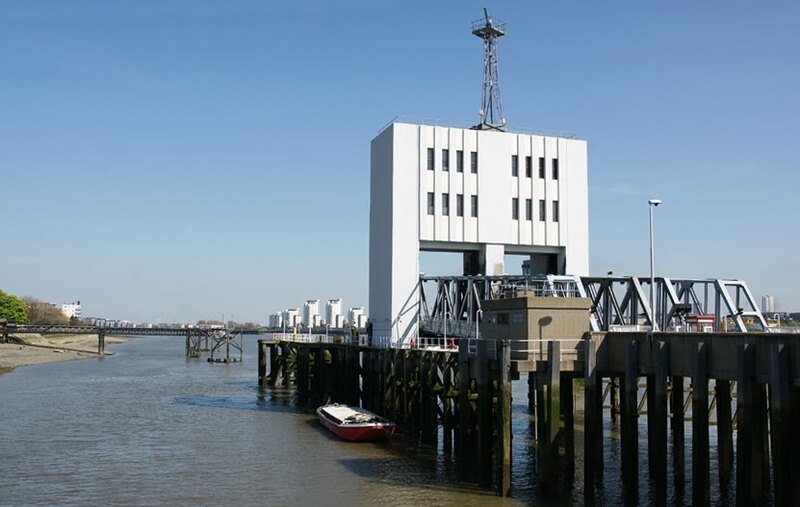 It's possible to take a free boat trip on the Thames: head down to the Woolwich Ferry which will take you between Woolwich on the south bank and North Woolwich on the, er, north. The crossing is short, and shared with cars and lorries on the upper deck, but slightly more scenic than you might expect with views across to the Thames Barrier as well as the more industrial riverscape to its east. Originally there was only one boat, so the crowds who flocked to Woolwich on the opening weekend (about 25,000 arrived by train) must have faced long queues and busy boats. They got to ride by paddle steamer, only replaced by motor ships in 1963. 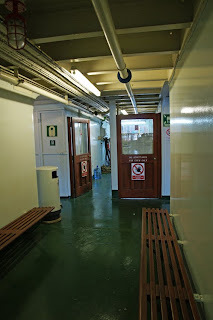 Features on the lower deck such as a smoking lounge suggest that the interiors haven't been substantially altered since; facilities are fairly basic, with bench seating, but then the crossing is only five minutes long. 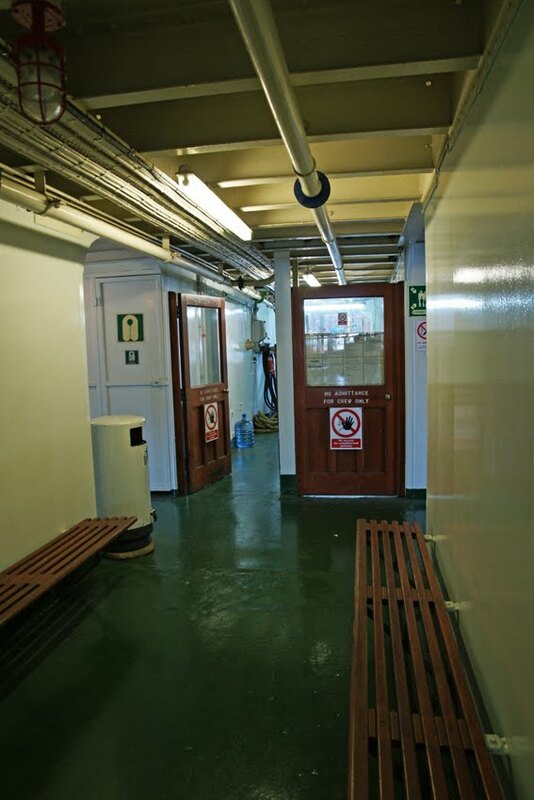 At either end, the ferries are loaded and unloaded via hinged ramps operated by hoist towers so that the rising and falling tides can be accommodated. Although I didn't share my crossings with more than a handful of other foot passengers, there were plenty of vehicles on the upper deck. 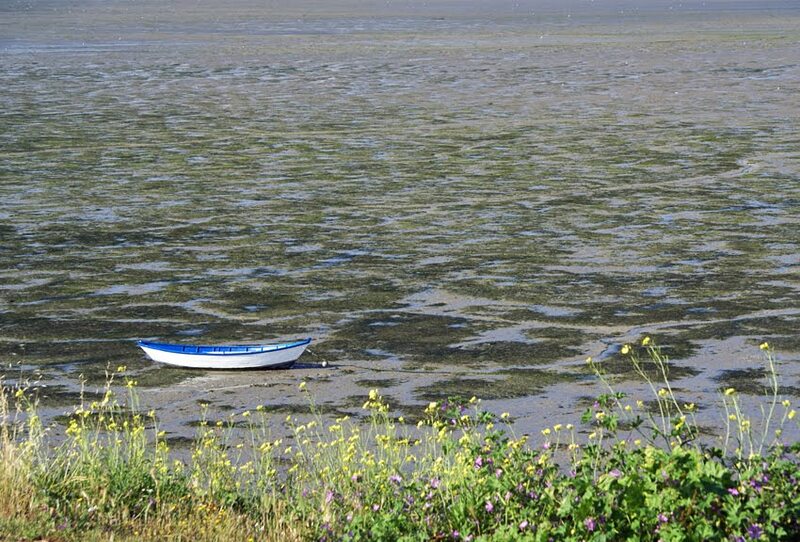 Indeed, more than one million vehicles are transported across the river every year at a cost of just over £7 million. The crossing continues to be an important part of London's infrastructure, then, with the main threat to its future - the proposed Thames Gateway Bridge - looking more and more improbable. 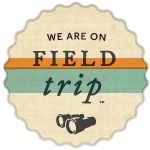 Explore further: this website by John King has huge amounts of information and photographs. BBC News have a nice report on the service here. 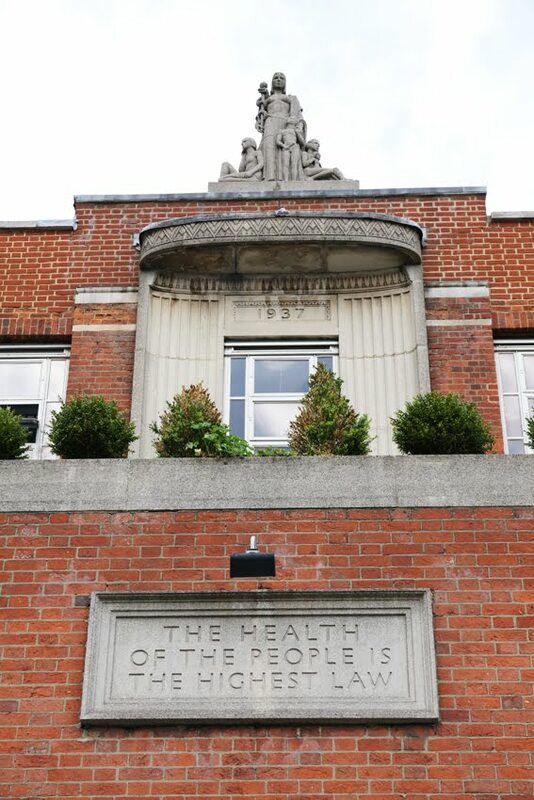 This inscription, a quotation from Cicero, stands above the door of a building at the Elephant end of the Walworth Road. A little higher is the date, 1937, but you hardly need to be told that as the Art Deco touches shout '1930s'. The plants here are an integral part of the design: their planters are built in to the coping. 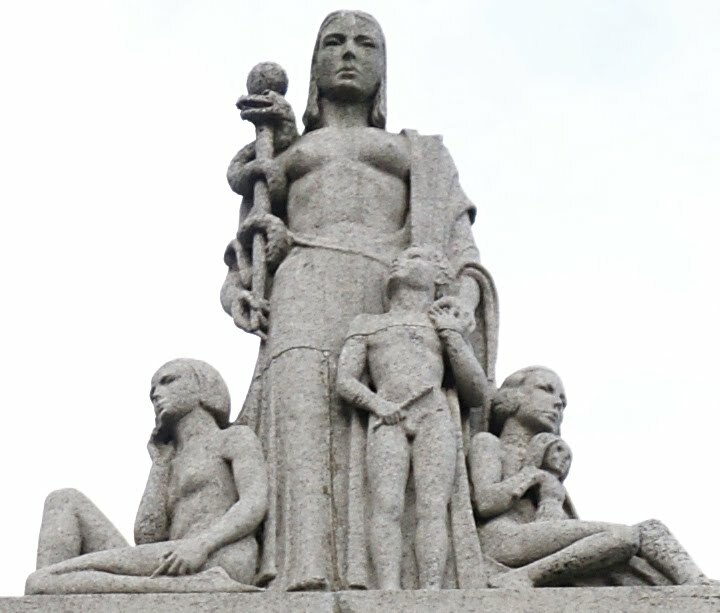 At the apex, a woman holding a rod of Asclepius (the symbol of healing) is surrounded by children. Note their 1930s bobs. 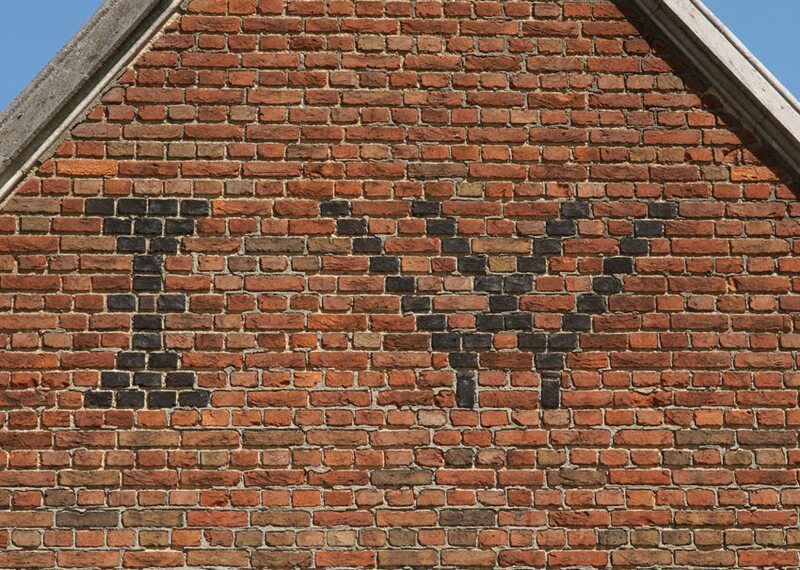 With all these clues, you've probably worked out that the building had a medical purpose: it was the Public Health Centre at Southwark. Inside were facilities including doctors, dentists, a TB clinic, maternity services and a solarium for exposure to artificial sunlight. The Public Analyst was also based here, with an office as well as a laboratory. This combination of services in one place was pioneering - a sign of the influence of Alfred and Ada Salter on the area - and attracted plenty of press coverage and borough pride. Newspapers put the cost of the centre at between £50,000 and £60,000. Among the list of facilities, the sunlight clinic perhaps seems surprising. However, in the 1920s and 1930s there was great awareness of sunlight's use in improving health, notably to treat TB and rickets. Since lack of time outdoors and the British climate could limit exposure to the sun, especially for slum children and some workers such as miners, clinics offered 'artificial sunlight'. (Click below to see footage of a Maharajah's visit to one such clinic in 1925.) Indeed, progressive reformers emphasised the importance of light in general, and the Public Health Centre was praised for its bright interiors. The building is still a clinic today, although it no longer offers the range of services originally housed here. However, it is interesting that there has recently been something of a return to this pre-NHS concept with the (often controversial) arrival of polyclinics. The most inspirational aspect of the building, though, is surely that inscription carved above its door. 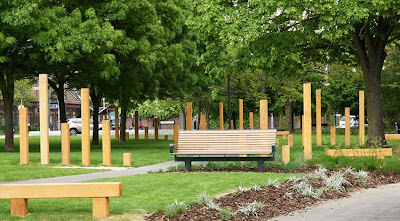 The Margaret McMillan park has reopened! It's definitely an improvement. 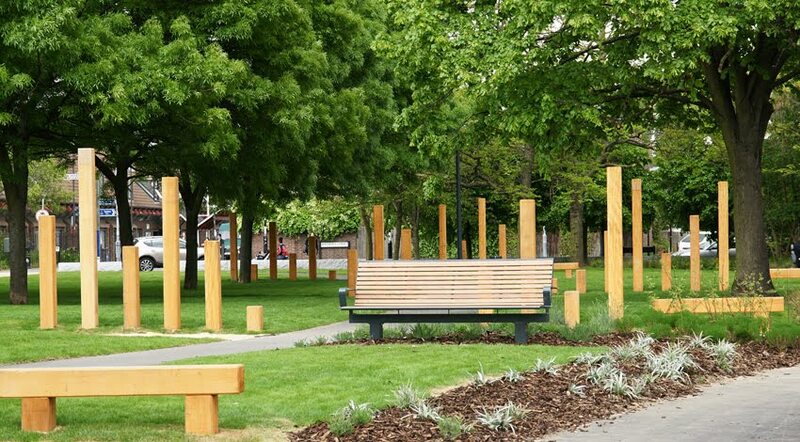 I was left asking the same question as Deptford Dame, though - what are those wooden posts for? The number of pubs on Deptford High Street has just halved, to one. 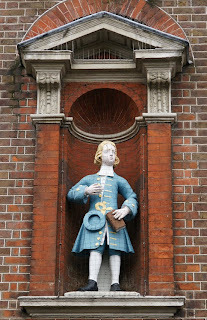 Did you know that the King's Jockey in the late 1930s was a Deptford boy? 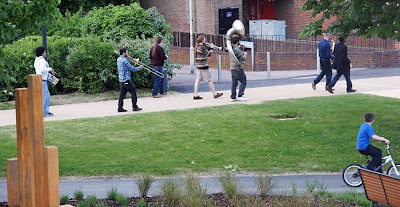 Neither did I until I read this post on Deptford Misc. This Wednesday 19 May, Urban Screen is showing the film SUS at the Albany, followed by a panel discussion with lead actor Clint Dyer, screenwriter Barrie Keefe and local councillor Duwayne Brookes. SUS, centring on a police interrogation on election night 1979, looks at institutional racism; more information here. Yesterday, the Royal George privateer arrived at Deptford, from a cruize. Soon after, a press gang endeavoured to press the crew; but they made so stout a resistance, that the man of war’s boat was obliged to sheer off without them; but information being given, that the above privateer had searched several vessels in the streights of Gibraltar, which had the Plague on board, orders were sent down that they should immediately sail to Stangate Creek, and there perform quarantine. It was built in the early 1970s; less than forty years later, it's due for demolition. 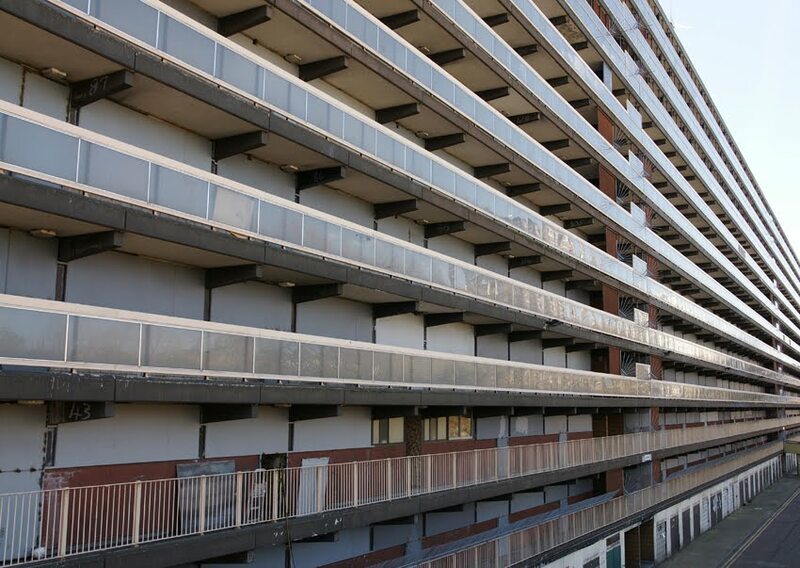 This block of flats on the New Kent Road is part of the Heygate estate, and will be knocked down under the Elephant & Castle regeneration plan. 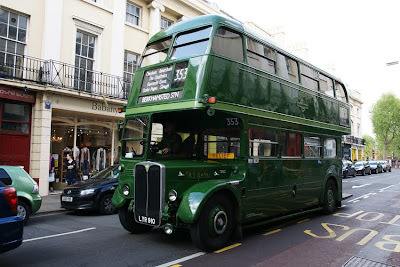 Passing regularly on the bus, I've seen more and more flats swap curtains and painted doors for blank metal plates. As of January, only 100 of the 1,100 homes on the estate were still occupied. Heating and hot water were turned off a few weeks ago, demolition is beginning. The process of decanting tenants has not been unproblematic or uncontroversial. Many had no choice but to leave the area altogether (meanwhile, the nearby Strata building has hundreds of flats, average cost £500,000; only twenty of them were reserved for rehousing Heygate residents). Underlying the process is the question facing many such areas: does regeneration mean improving living conditions for those already there, or gentrification to attract more middle-class residents? With all the election goings-on, we're perhaps more aware than usual of the Queen's role as head of state. 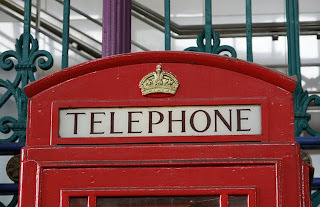 However, we have endless daily reminders - including the crowns adorning traditional red telephone boxes. There's more to these symbols than you might think, too. 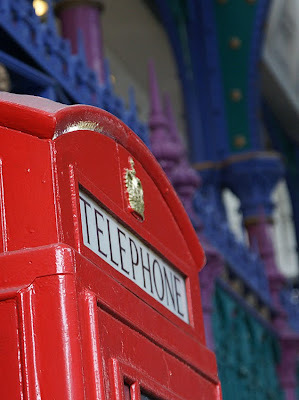 The history of the telephone box formed part of the post office heritage tour because until British Telecommunications was formed in 1981, telephones came under the General Post Office's remit. 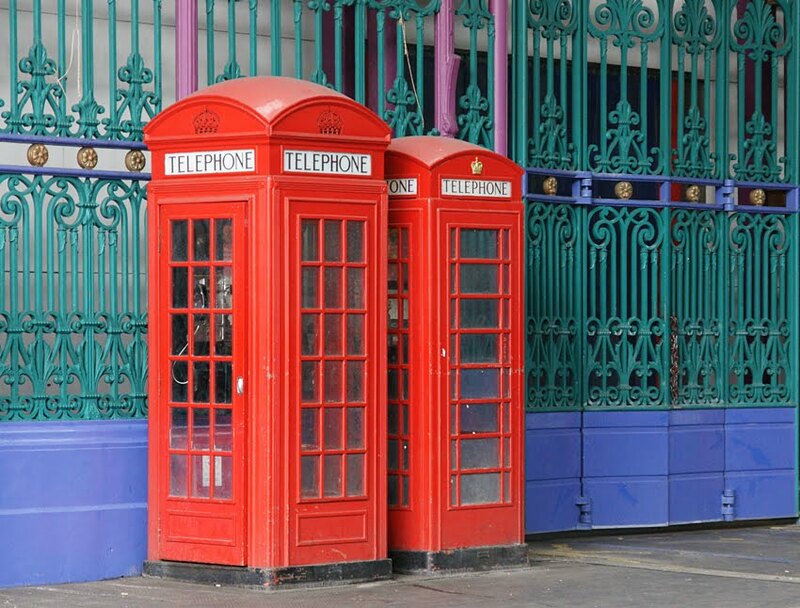 In the 1920s, the GPO was keen to erect kiosks in London and held a competition to find a suitable design which the borough councils would accept. The result was Giles Gilbert Scott's famous red cast-iron design, officially K2 (K for kiosk, and 2 because an earlier concrete design had been used elsewhere in the country). K2 was mainly used in London. Its crown is a distinctive cut-out near the top of the cast-iron box. 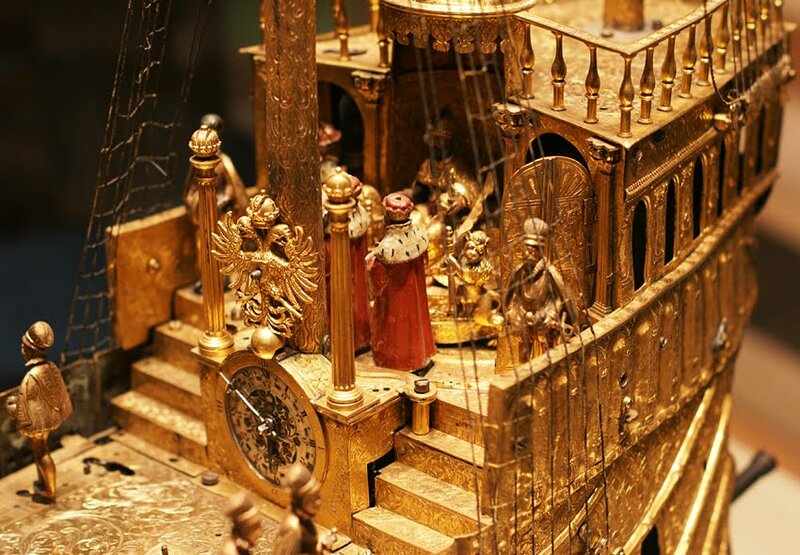 That's because it wasn't just a piece of decoration, but also provided ventilation. 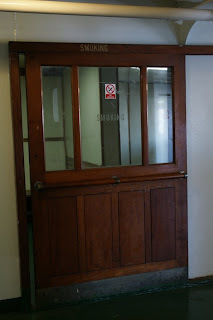 However, the K6 - the similar but smaller design of 1935 which is most common outside London (and not uncommon within it) hid its ventilation in a slit along the top of the panels. The crown became purely decorative - and in 1952, its design would change again. 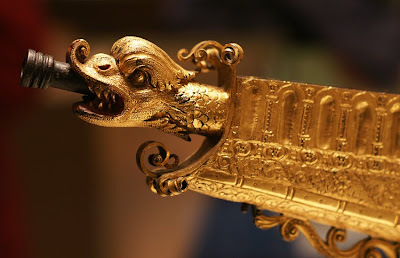 Until now the decoration had been a 'Tudor crown', but the new monarch Elizabeth II wanted the actual coronation crown, the King Edward Crown, to be used. In Scotland, though, the St Andrew's Crown was preferred - and to allow for the two different designs, a slot-in panel was added. You can see the edges in the picture below. So what's in a crown? 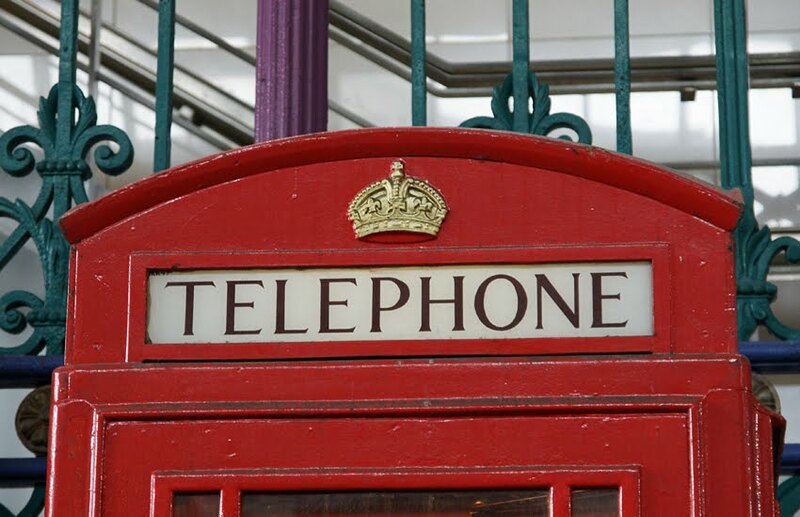 You can tell the model of the phone box, the date (pre- or post-1955), and which country you're in. Should you be inside a K2, that crown is also letting in the fresh air. Not bad for a bit of decoration! The colourful setting for the boxes in these pictures was Smithfield Market. 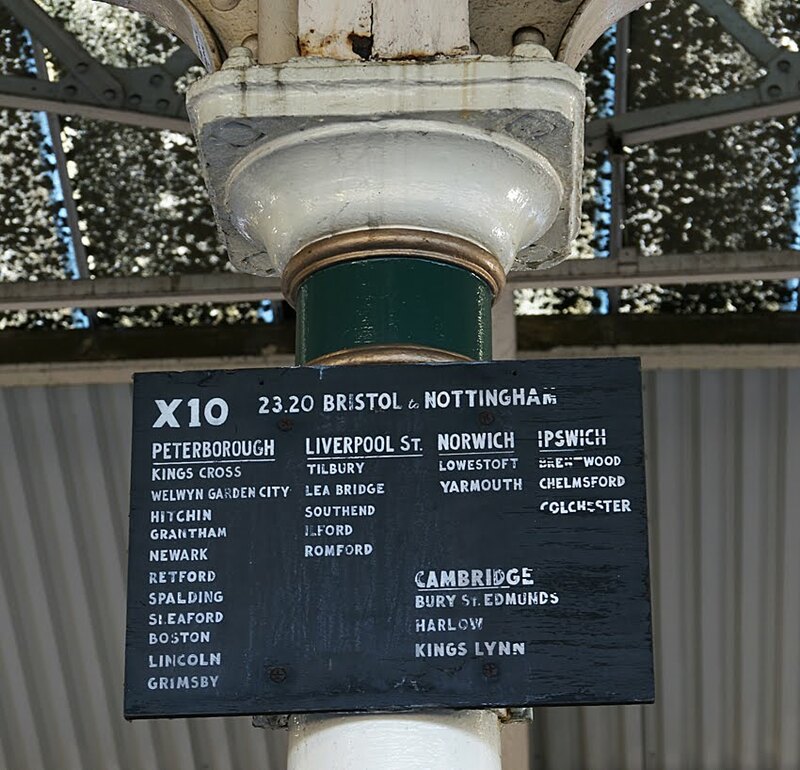 The missing model numbers are K3, a concrete version; K4, a trial box which included a postbox and stamp vending machine; and K5, a wooden box for temporary use. 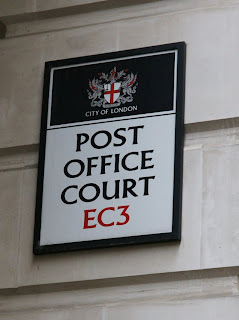 On Saturday, I joined the British Postal Museum & Archive for a walking tour of London's Post Office heritage. As well as the locations visited, the tour provided a lot of insight into the street furniture all around us. First, though, when did Britain's postal service begin? If your answer includes 1840, Sir Rowland Hill or the Penny Black then I'm afraid you get nul points - the service is actually much older than that. 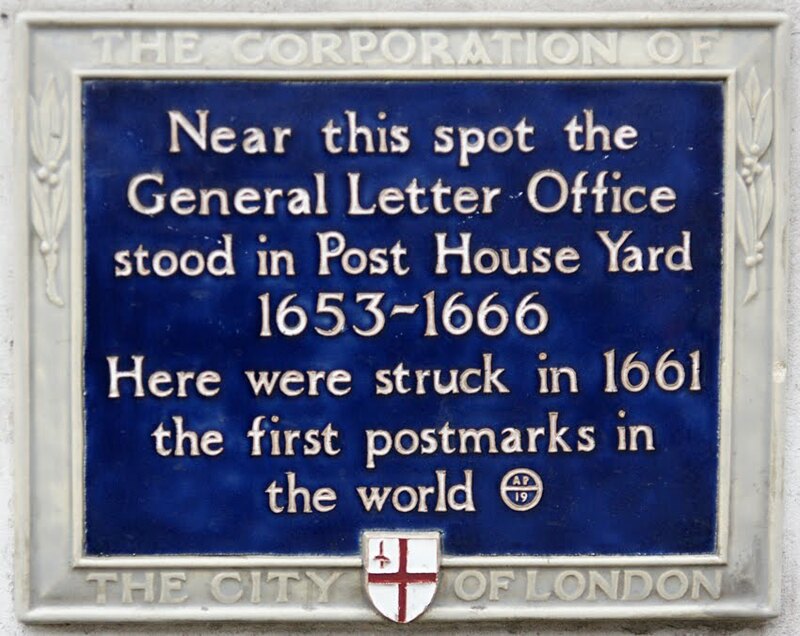 In 1643 the first General Post Office was established, complete with Postmaster General. 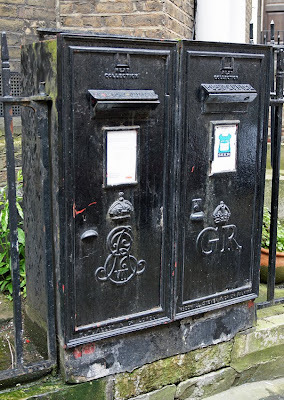 It was tiny compared with the modern service: in London, letters could only be posted in one place - Lombard Street - and the service had only 316 employees across the whole country. 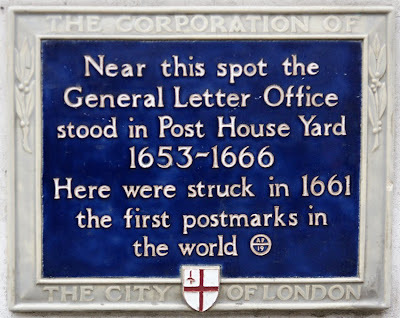 Nonetheless, it made some important innovations, not least the first postmark in the world struck in 1661. 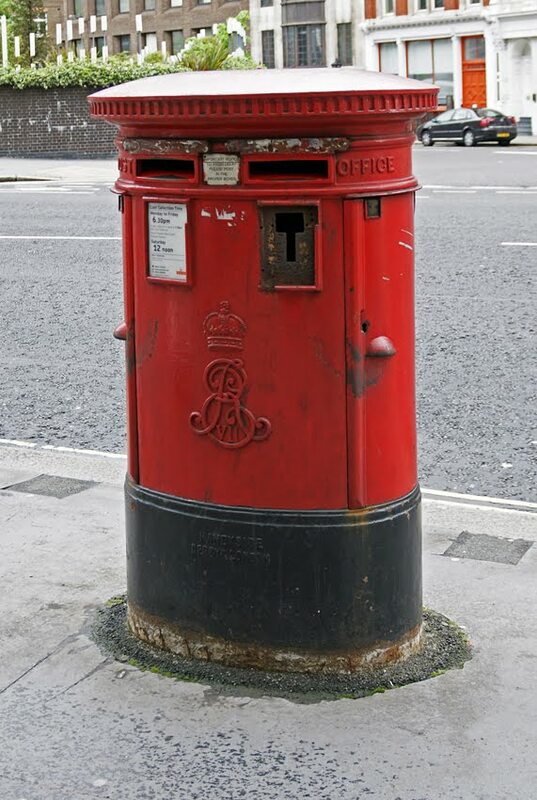 So what was all the fuss about Rowland Hill and the Penny Black? Quite simply, he revolutionised the postal system. Until then, postage was calculated by a combination of number of pages and distance travelled and was paid by the recipient. It was expensive, the cost was somewhat unpredictable, and of course the recipient might simply refuse to pay and reject the letter at the end. Hill's brainwave was to charge a single fee, one penny, to be paid in advance by the sender. In order to show that the penny had been paid, it was decided that a gummed rectangle of paper should be affixed to the envelope: a postage stamp. The first such penny stamp was the famous Penny Black. To help with delivery, London was divided into postal districts in 1855. 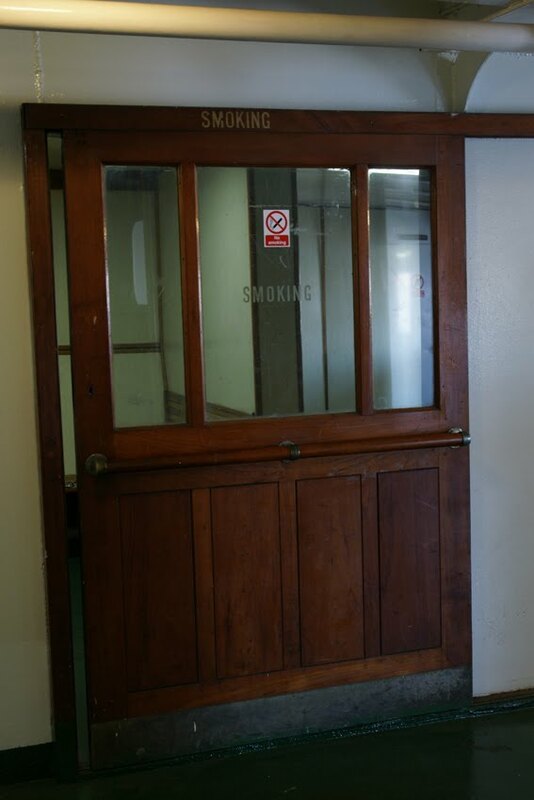 These were further sub-divided with numbers during the First World War, to help improve efficiency. Such innovations are very much a part of our streetscape, still present on every road sign. Even more obvious, of course, is the post box. 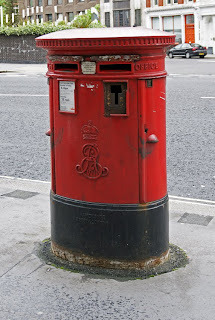 Introduced in the mid-nineteenth century, they're generally red with the reigning monarch's initials on the front. However, it's all a little more complicated than that. To give just a few examples, some Victorian boxes had the insignia on the side rather than the front (and when doors were replaced they generally had the initials of the current monarch so can be misleading - or even unmatched on the same box). 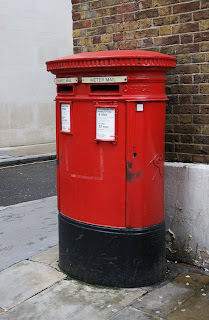 The double boxes are very common in London, originally divided into London and other mail, then first and second class, and most recently stamped and meter mail. Today the division doesn't actually matter, but the greater capacity of the double-width design remains useful. By the end of the walk, our eyes had been opened to the history standing on our streets. We also understood just how much the Post Office had shaped London: indeed, the area around Postman's Park was so dominated by the institution that today's St Paul's underground station was originally named Post Office. The tour was part of the London 2010 Festival of Stamps. Until next Saturday, you can also visit the International Stamp Exhibition at the Business Design Centre, Upper Street (admission free). At the Guildhall Art Gallery, Empire Mail: George V and the GPO runs until 25 July.